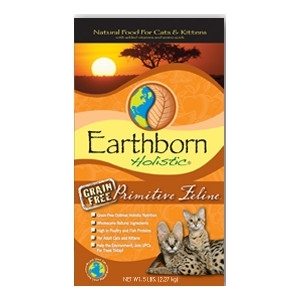 Earthborn Holistic® Primitive Feline™ is formulated to provide this high protein nutrition with a taste your cat will love. Along with protein, there is a healthy mix of vegetables and fruits, which contain natural antioxidants important for everyday optimal health. Vitamins and minerals help support your cat's immune system. This grain-free diet is a healthy alternative and is sure to be one your cat will enjoy.